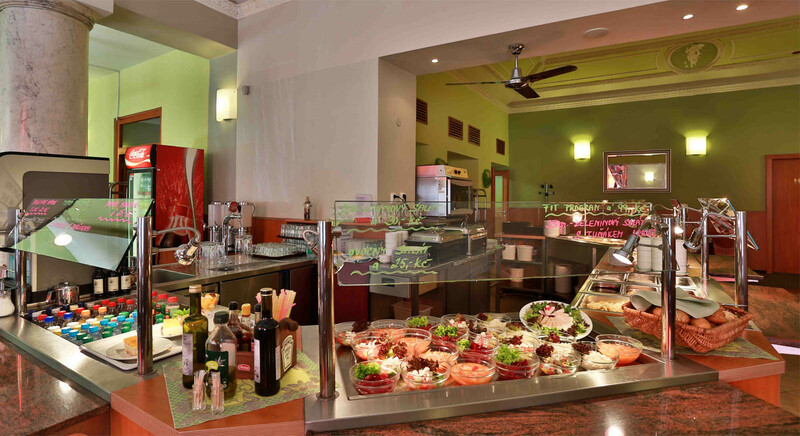 An unlimited variation of culinary specialities, fresh vegetable salads and home made desserts, all presented on a self-service board right in front of you. Choose exactly what your eyes take a fancy and taste the genuine atmosphere of a celebration of good food and drink just like at a real fiesta. Lunch box (also for soup) is complimentary should you decide to take lunch with you. Every 50th paying customer receives FREE dessert! Information about allergens can be provided by our restaurant staff upon request. We are glad to welcome you at the breakfast buffet in our Fiesta restaurant. You can choose from a wide range of warm dishes (roasted ham, sausages, boiled eggs) as well as cold ones (3 kinds of salami 3 kinds of cheese), yogurts, fruit, muesli, pancakes, homemade cakes, and lot more. Are you looking for a place for business breakfast or lunch? You can book a private Fiesta lounge. On request the lounge can be equipped with a PC with Internet connection. The lounge offers comfortable seating for up to 8 people. Hotel Atlantic is offering its conference facilities for organizing of conferences, meetings, seminars, business breakfasts and various celebrations. There are two rooms. Congress hall (13m x 11m x 6m) is suitable for organizing of seminars and corporate events. Fiesta lounge with capacity of 8 persons (4m x 4m x 2,5m) is suitable for smaller meetings. For example: Meetings with a coffee break, Banquets, Cocktails, Celebratory lunches and dinners, Business breakfasts, A glass of wine, Weddings, Graduations, Name-day and birthday celebrations, Garden parties and others.